The Cyclepedia.com Honda CRF80F, CRF100F, XR100R, and XR80R online service manual features detailed full-color photographs and complete specifications with step-by-step procedures performed and written by a seasoned Honda dealer trained technician. Dealers can access this manual through our Cyclepedia PRO Product. 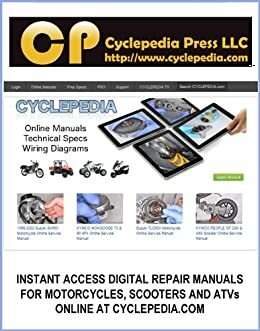 If you are a dealer and would like access to all of our online manuals for one low price please visit Cyclepedia.com. Your purchase includes a full-color wiring diagram that is not included in this e-book product due to limited display capabilities. If you need a wiring diagram, please contact the publisher and one will be provided.